Issued June 8, 2010, to Nintendo Co. Ltd. The ‘590 patent describes game apparatuses that are connected in a peer-to-peer manner that allow a player to play against opponents. During gameplay the apparatuses award points to the winner of each match. These points are accumulated and tallied on a server so they can be used to match up players in the future. The apparatuses attempt to match up users with similar stats to make the game more interesting and challenging for the players. The apparatuses also rank the scores of the players so that individual players can look to see where they rank in comparison to other users. Game apparatuses connected in a peer-to-peer manner play a competitive game with each other. 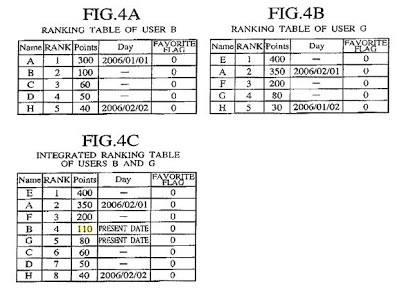 Each of the game apparatuses stores a ranking table ranking points of multiple users based on past games of the users. When finishing playing the game, the game apparatuses respectively calculate points obtained by the respective users based on the result of the game, and update the ranking tables based on the newly calculated points. The game apparatuses transmit and receive information on the updated ranking table to and from each other. Each game apparatus integrates the ranking table locally stored with the ranking table transmitted from the other game apparatus to generate a new ranking table, and displays the new ranking table on a display device. 1. A game apparatus, which is connectable to an other game apparatus in a peer to peer manner, for executing a competitive game with the other game apparatus having functions of executing the competitive game and generating a ranking of scores obtained in the competitive game, by causing a communicator to transmit information to, and to receive information from, the other game apparatus, the game apparatus comprising: a game executor that executes a current game of the competitive game with the other game apparatus while causing the communicator to transmit and receive information on the current game to and from the other game apparatus; a local score determiner that determines a current score obtained by a user of the game apparatus based on a result of the current game executed by the game executor; a ranking storage that stores user ranking information that ranks at least one previous score previously determined by the local score determiner in a past game of the competitive game and other scores obtained by other users in other past games of the competitive game; a ranking information obtainer that obtains opponent ranking information of an opponent user of the other game apparatus by causing the communicator to receive the opponent ranking information stored in the other game apparatus of the opponent user; a ranking integrator that integrates the current score determined by the local score determiner, the user ranking information stored in the ranking storage prior to the current game being executed by the game executor, and the opponent ranking information obtained by the ranking information obtainer, to generate new ranking information and to store the new ranking information in the ranking storage; and a ranking output that outputs the new ranking information integrated by the ranking integrator and stored in the ranking storage, wherein the ranking storage stores ranking information for a predetermined number of scores, the new ranking information, integrated by the ranking integrator, includes the predetermined number of scores, and when a number of scores to be integrated by the ranking integrator is greater than the predetermined number of scores, the ranking integrator includes a stored history ranking user selector that selects, from among scores included in the opponent ranking information, a score of a user that is included in the user ranking information that was stored in the ranking storage prior to the current game being executed by the game executor to be included in the new ranking information in priority to other scores included in the opponent ranking information.